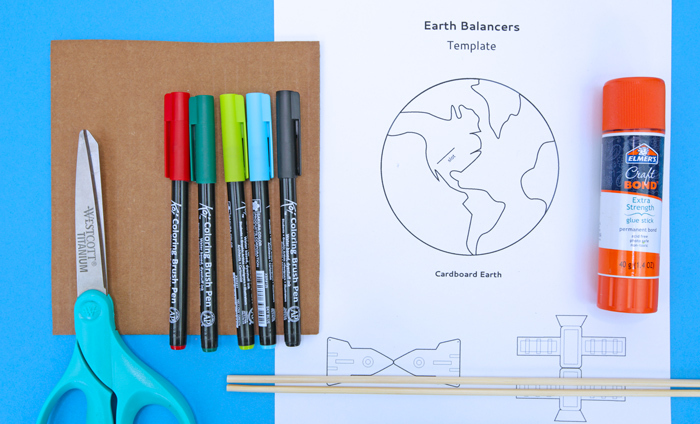 Are you planning on celebrating Earth Day with an Earth Day activity this year? It’s more important than ever for parents, teachers, and educators to impart just how precious our earth’s resources are and how we need to stand up and protect this incredible planet we all inhabit. I still remember when I was a kid and one of the biggest environmental challenges we faced was the hole in the ozone layer. A leading cause of the depleted ozone layer were chlorofluorocarbons AKA CFC’s, at the time used in aerosol cans. Once it was discovered that CFCs were causing the rapid deterioration of the ozone layer, manufacturers began to eliminate them, some voluntarily and some after regulations were created by the EPA. Read more about it here. The good news is that our ozone layer has replenished itself (though in 2018 scientists discovered that CFCs are mysteriously back again) and the take away is that we CAN and MUST solve our planet’s other environmental challenges before it’s too late. I have been watching Our Planet on Netflix; it’s an incredible series showing the power and beauty of the natural world, with the heartbreaking reality of what climate change is doing to animal habitats and why it matters to humans. There are some truly disturbing scenes of animals perishing because their habitats are literally disappearing and it really puts the necessity of addressing climate change NOW front and center. 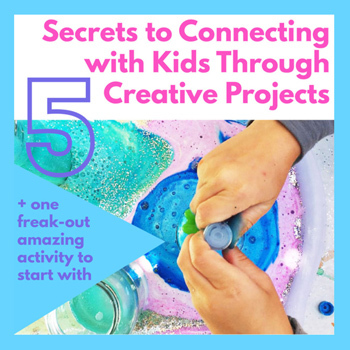 One of the best ways to begin a conversation about the environment with kids is through problem solving. Today’s project does just that. 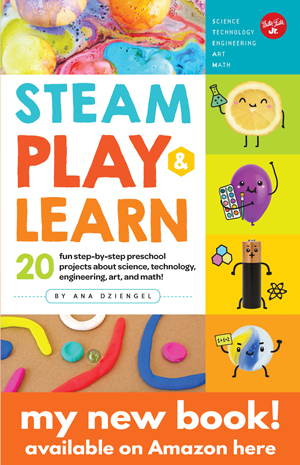 Not only is it constructed from recycled cardboard, it’s a lesson in physics, engineering, and math AND it doubles as a DIY toy. Another bonus? It teaches the concept of balance- very apropos when discussing the challenges we face in protecting our planet in the years to come. 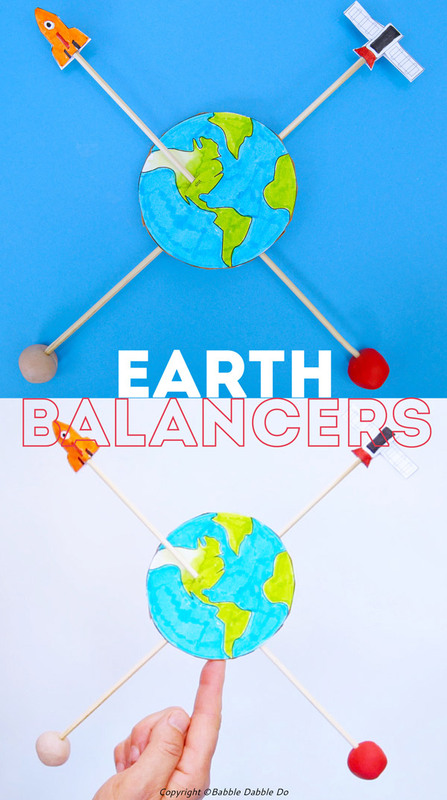 Earth balancers are based on our original Balance Hearts project which you can see here. 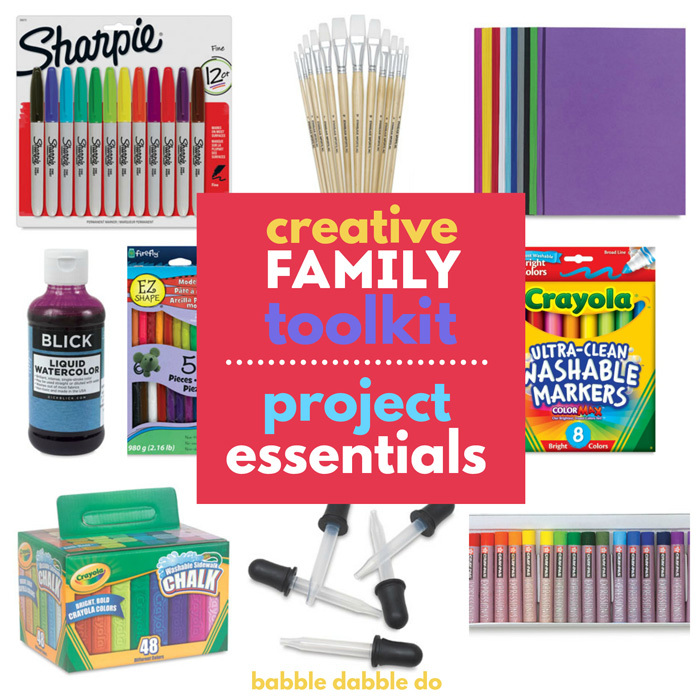 Step 1 Color template as desired. 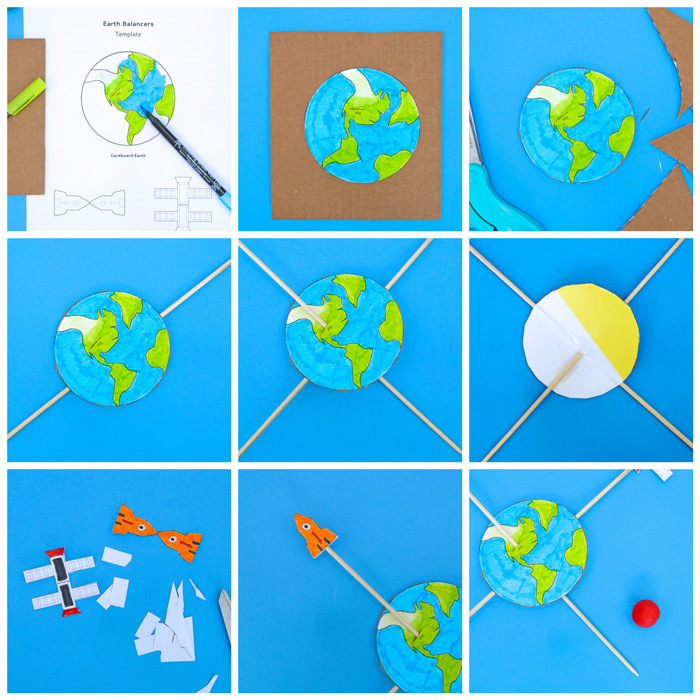 Step 2 Cut out earth, rocket, and satellites. Step 3 Glue earth to a piece of cardboard using a glue stick. Step 4 Cut out cardboard earth. Step 5 Adults only Using an Xacto, cut a ½” long slot in the top layer of the cardboard earth in the location indicated on the template. Carefully feed one of the skewers through the slot and out the edge of the cardboard. Step 6 Adults only Repeat step 5 with a second skewer on the opposite side of earth. Clip off sharp ends of skewers. If the skewer pokes through the back, tape it to the cardboard to secure in place. Step 7 Add glue to rocket and place on the top end of one skewer. Press to secure in place. Step 8 Repeat with satellite on the end of the second skewer. Step 9 Add a ball of clay to lower end of each skewer. 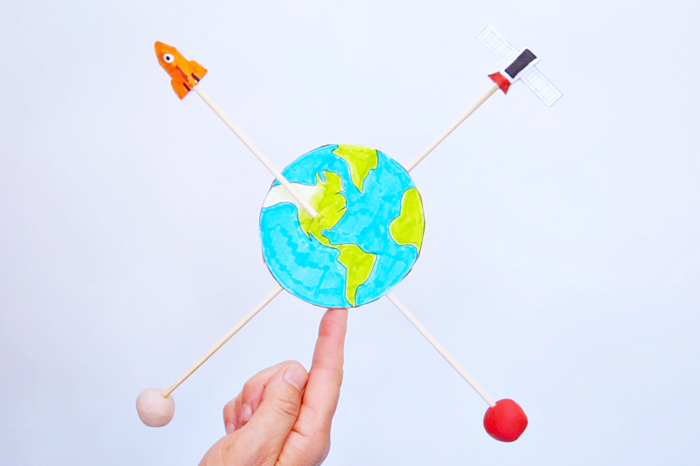 Step 10 Balance the earth on your fingertip! If your earth isn’t balancing properly, adjust the location of the skewers. Make sure they are placed at about the same height. Also make sure the clay spheres are large enough. You need to have weight at the end of the skewers to balance the toy. Balance Balance is the even distribution of weight, allowing an object to remain upright. Center of gravity Gravity is the force that pulls objects towards the earth’s center and keeps us on the ground. The center of gravity is the point in which the weight of an object or body is perfectly balanced so that the object will not tip over. 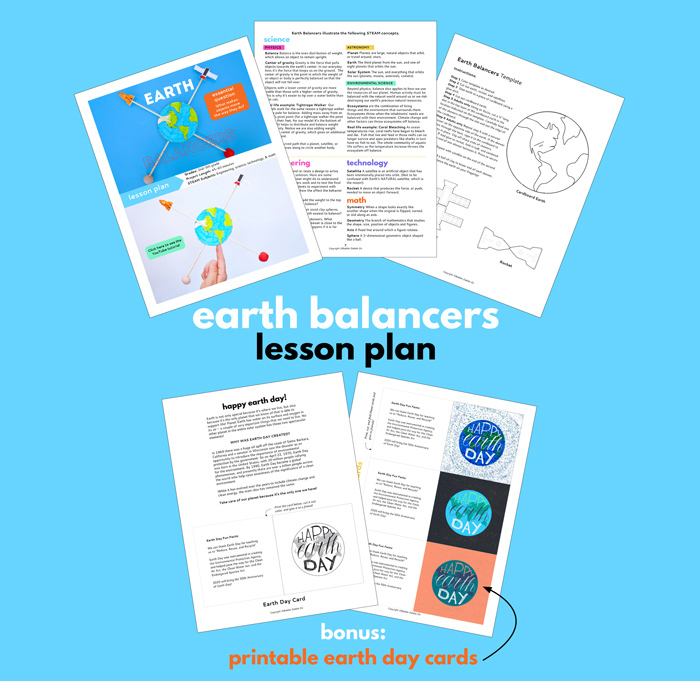 Earth Balancers are a hands-on way to explore how to find the center of gravity. Objects with a lower center of gravity are more stable than those with a higher center of gravity. The earth balancers works because the mass of the clay spheres below the cardboard earth weigh it down allowing it to balance on a pivot point. Adding mass away from an object’s pivot point helps to distribute and balance weight more evenly. This is why tightrope walkers use long poles to help them balance. What happens when you move the skewers up and down? Does the pivot point (the earth’s center of gravity) change? If the clay spheres are smaller or larger how does that effect the center of gravity? Symmetry When a shape looks exactly another shape the shape when the original is flipped, turned, or slid along an axis. Geometry The branch of mathematics that studies the shape, size, position of objects and figures. Axis A fixed line around which a figure rotates. 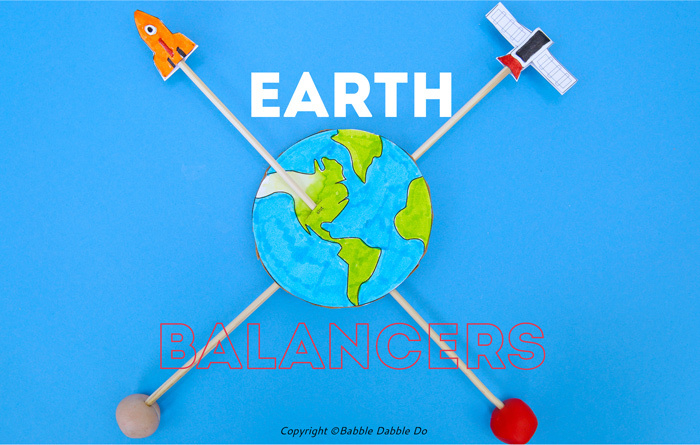 Not only does our planet Earth have an axis upon which it rotates, our Earth Balancers stay upright because weight is evenly distributed on either side of an axis that runs down the center of the cardboard earth circle. In nature two of the most prominently seen geometries are the circle and sphere. Think the sun and moon, planets, flowers, fruit, and eyes; there are many examples of circles and spheres in nature. Can you think of any others? 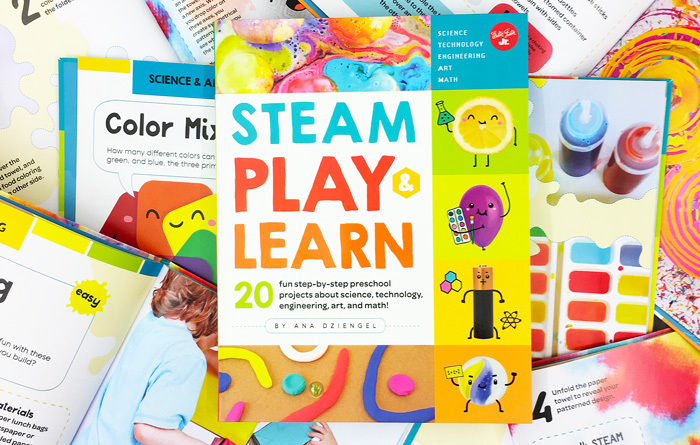 This Earth Day activity demonstrates so many different educational concepts and opens the door to conversations with kids about the environmental choices we make. Let’s protect our precious earth for our kids future!